Tumors arising from the cranial nerve sheath are common intracranial neoplasms, with only few articles describing their imaging characteristics. In this present study of four cases of schwannomas originating from the cranial nerves in the head region, we are discussing the radiological features on imaging with the clinical presentation and contrasting them with other differentials in their respective locations. Magnetic resonance imaging and computed tomography were done in these cases and correlated with clinical and biopsy findings. Intracranial nerve sheath tumors represent only 4–8% of intracranial neoplasms with the most common being vestibular schwannomas, followed by trigeminal nerve tumors. These neoplasms can arise, although infrequently, from other cranial nerves, both intra and extracranially. Acoustic neuroma is the most frequent benign tumor at cerebellopontine angle. It accounts for 8–10% of all primary intracranial space occupying lesions and 80% of cerebellopontine angle masses. Acoustic schwannomas present with unilateral hearing loss in more than 90% of the patients and is often accompanied by tinnitus. Trigeminal schwannomas are rare intracranial tumors that account for a mere 0.8–8% of all intracranial schwannomas. Trigeminal schwannomas present with dysesthesia, mild facial pain, frontotemporal headaches, or with symptoms caused by mass effect and compression of adjacent structures, namely, conductive hearing loss from Eustachian tube More Details blockage, diplopia or hemianopia from cavernous sinus involvement, or facial soft tissue asymmetry. Schwannomas originating in the jugular foramen are extremely rare, and there are approximately 200 cases described in the literature. They represent 2.9–4% of the intracranial schwannomas, and less than 4% of all lesions of the temporal bone. The jugular foramen schwannomas that extend to the posterior cavity usually manifest primarily with deafness, vertigo, and ataxia. For the jugular foramen lesions that expand to extracranial proportions, these present with hoarseness, diminishing of the coughing reflex, and reduction of the motor strength of the shoulder girdle, symptoms representing the typical jugular foramen syndrome, which was absent in the case reported here. The clinical symptoms of schwannomas of the jugular foramen vary considerably according to its growth pattern. The tumor is generally composed of Antoni A and B types of tissues histologically. Type A tissue is highly cellular with little extracellular matrix whereas type B tissues are less cellular with more loosely arranged cells. These histological types may influence the imaging characteristics. Four cases are being discussed in the present paper, of which two are of acoustic schwannomas (cases 1 and 2), one trigeminal nerve schwannoma (case 3), and one jugular foramen schwannoma (case 4). Out of these cases, two were females and two were males. A 32-year-old male presented with progressive tinnitus of the right ear since 1 year with no other medical disease, seizure, or trauma. Magnetic resonance imaging (MRI) of the brain was performed of the patient plain and with contrast. MRI revealed an extra-axial lesion in the right cerebellopontine angle region, which showed isointense signal to brain parenchyma on T1 and iso to hyperintense signal on T2/STIR images [Figure 1]. It is abutting REZ of the 7 and 8th cranial nerves extending into the internal auditory meatus giving an icecream cone appearance s/o acoustic schwannoma. A young 25-year-old female presented with complaints of vertigo and headache with left-sided hearing loss. Plain and contrast MRI brain was performed for the patient. 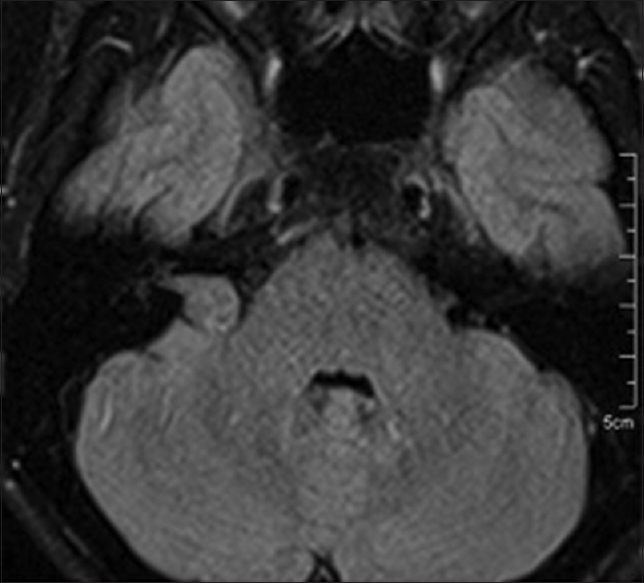 MRI revealed a large extra-axial lesion in the left cerebellopontine angle region, which showed isointense signal to brain parenchyma on T1 and hyperintense on T2/STIR [Figure 2]. It is minimally extending into the internal auditory meatus giving an icecream cone appearance s/o acoustic schwannoma. Both the patients were referred to the neurosurgery department for further management. In a young female with progressive proptosis, MRI brain revealed an extra-axial heterogeneously T1 hypointense and T2/FLAIR hyperintense mass in the left middle cranial fossa extending anteriorly into intraconal space and displacing optic nerve inferomedially [Figure 3]. There were areas of hyperintensity in optic nerve s/o involvement. Posteriorly, there was effacement of the prepontine cistern. There is medial extension into the cavernous sinus and Meckel's cave with encasement of internal carotid artery (ICA) showing normal flow void. Laterally, the mass was extending into the temporal fossa. Post-gadolinium scans showed inhomogenous marked enhancement of the mass. GRE sequences showed tiny foci of blooming s/o hemorrhage. Rest of the blood investigations were unremarkable. The patient was referred to neurosurgery where resection and biopsy report revealed schwannoma arising from the ophthalmic division of the trigeminal nerve. An elderly hypertensive male patient presenting with vertigo and posterior headache underwent MRI brain which showed an extra-axial hetrogenously T1 hypointense T2/FLAIR hyperintense mass in the region of jugular foramen on left side and extending into the foramen of magnum with erosion along with involvement of the left lateral part of the occipital bone. There was mass effect on the medulla and cervicomedullary region with slight displacement to the right. There was mild extension into left cerebellopontine angle region just below the vestibulocochlear nerve complex level, which appears normal, no obvious involvement of brainstem was seen, and the mass was extending into the region of foramen of Luschka. Post-gadolinium scans showed inhomogenous marked enhancement of the mass. Expansion of the jugular foramen was seen with sharp outline with a sclerotic border, which was well seen on CT scan with bone algorithm [Figure 4]. The tumor was isodense with brain on noncontrast CT images. The diagnostic approach to neurological problems has undergone significant change with the introduction of MRI. MRI has proven to be an excellent technique for visualization of the posterior fossa and cerebellopontine angle tumor. MRI can be acquired with equal clarity in any orientation, i.e., axial, sagittal, coronal, image, and artifacts from bone are absent on MRI. MRI is the imaging technique of the choice for cerebellopontine angle and internal auditory canal masses. CISS MR imaging sequence has the capacity to visualize the individual cranial nerves and display the exact anatomical location of the mass along the nerve. Diffusion MR demonstrates T2 shine through effect in the form of bright signal on both diffusion weighted and apparent diffusion coefficient images. Ninety percent of vestibular schwannomas comprise an intracanalicular component, which frequently leads to splaying of the porus acousticus and ensuing in the trumpeted internal auditory meatus (IAM) sign. In up to 20% of the cases, these are only extracanalicular and touching the porus acousticus. Typically, a tiny cerebrospinal fluid cap between intracanalicular portion and the cochlea is seen. However, these masses may sometimes extend laterally into the middle ear through the cochlea (transmodiolar) or vestibule (transmacular). Infrequently, these masses may remain small in size and restricted to the vestibule (intravestibular) or else in the cochlea (intracochlear) or both (vestibulocochlear). These SOLs usually extend into the extracanalicular space to involve the cerebellopontine angle, which is also the route of least resistance, and can lead to “icecream cone” appearance. Cystic degeneration is seen frequently in larger tumors whereas smaller masses tend to be solid. Acoustic neuromas are isointense relative to the pons on magnetic resonance T1-weighted images, mildly hyperintense on magnetic resonance T2-weighted images, and enhance intensely after intravenous administration of gadolinium contrast. Other differential cerebellopontine angle masses include meningiomas and epidermoid cysts. Meningiomas demonstrate homogeneous gadolinium – DTPA enhancement. Epidermoid cysts do not enhance on MRI. Jugular foramen schwannomas generally originate from the ninth cranial nerve, and the clinical symptoms may be analogous to those of a vestibular schwannomas due to mass effect by the growth of the tumor in the posterior cranial fossa.,, Glomus jugulare is a key differential diagnosis, and is an extremely vascular tumor with intense contrast enhancement. It also shows multiple small flow voids giving “salt and pepper” appearance on MR sequences whereas the schwannomas do not show internal flow voids. Unlike jugular foramen schwannomas, glomus jugulare tumors expand the jugular foramen by causing uneven erosion of the margin of the jugular foramen, and with destruction of the adjacent bone, which is well seen with CT with bone algorithm., Metastatic lesions or lymphoma may also invade the jugular foramen, however, the bony changes in all likelihood are osteolytic or destructive with less sharply defined bony margins in contrast to schwannomas in which bony margins are sharper. In the preoperative period, it is often difficult to ascertain the exact cranial nerve from which the tumor is arising which is usually identified only during surgery and from post-operative neurological deficit. Schwannomas of jugular foramen may arise from cisternal, foraminal, or extracranial parts of the nerves. Masses arising from cisternal part grow intracranially and in cerebellopontine angle region; masses arising from the foraminal part primarily enlarge the bone in the jugular foramen; and SOLs arising from the extracranial portion present with extracranial mass. MRI is a useful modality and study of choice in the diagnosis of CPA schwannoma because of its high sensitivity and specificity, especially after the use of contrast. MRI provides an accurate and noninvasive method to evaluate patients who have hearing loss and are suspected of having vestibular schwannoma. Jugular foramen schwannomas are rare masses with patients who frequently presenting with symptoms of eighth cranial nerve palsy or cerebellar/brainstem compression. Infrequently, these lesions may present, as symptoms of the 9th or 10th to 12th cranial nerves palsy. Suitable imaging techniques along with clinical correlation should allow precise delineation of tumor origin and type and indicate the appropriate surgical approach. Further, MR and CT imaging both are important to accurately diagnose trigeminal schwannomas. 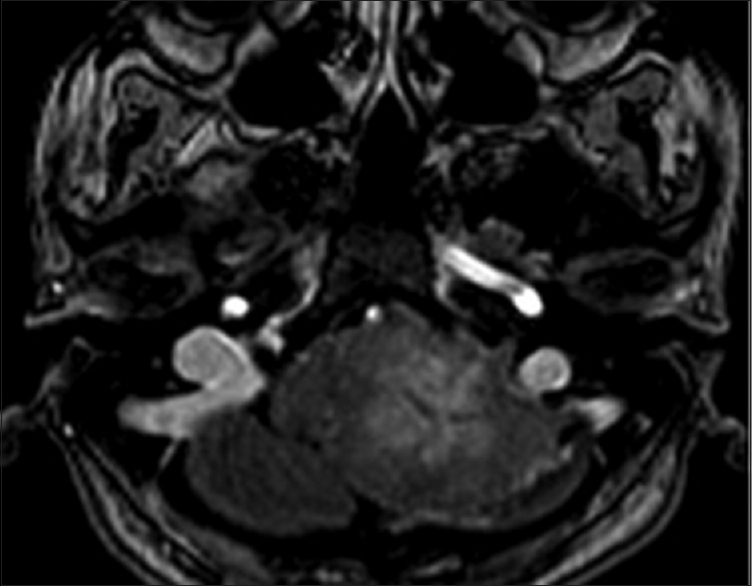 A diagnosis of primary schwannoma of trigeminal nerve must be strongly considered in patients presenting with symptoms of trigeminal neuralgia or diplopia. MR provides better visualization of the cranial nerves, whereas CT best visualizes the foraminal involvement at the skull base. As these tumors are slow growing and can assume great dimensions before they produce symptoms, MR imaging is of importance in the early detection of these tumors. Jeong KH, Choi JW, Shin JE, Kim CH. Abnormal Magnetic Resonance Imaging Findings in Patients With Sudden Sensorineural Hearing Loss: Vestibular Schwannoma as the Most Common Cause of MRI Abnormality. Medicine 2016;95:e3557. Lawson McLean AC, McLean AL, Rosahl SK. Evaluating vestibular schwannoma size and volume on magnetic resonance imaging: An inter- and intra-rater agreement study. Clin Neurol Neurosurg 2016;145:68-73. Imaging Findings in Sensorineural Hearing Loss: A Pictorial Essay. Can Assoc Radiol J 2016 May 18 [ahead of print]. Zhang L, Yangy, Shujan X, Wang J. Trigeminal Schwannomas. A report of 42 cases and review of the relevant approaches. Clin Neurol Neurosurg 2009;111:261-9. Wilson MA, Hillman TA, Wiggins RH, Shelton C. Jugular Foramen Schwannomas: Diagnosis, Management, and Outcomes. Laryngoscope 2005;115:1486-92. Sun Y, Huang Q, Yang J, Wang Z, Wu H. Management of jugular foramen Schwannomas. Zhonghua Er Bi Yan Hou Tou Jing Wai Ke Za Zhi 2015;50:546-50. Lee M, Tong K. Jugular foramen schwannoma mimicking paraganglioma: Case report and review of imaging findings. Radiol Case Rep 2016;11:25-8. Singh P, Kaur R, Singh R, Kaur M. Oculomotor nerve schwannoma of orbit with extension into cavernous sinus. Clin Cancer Investig J 2016;5:278-80. Izycka-Swieszewska E, Szurowska E, Kloc W, Rzepko R, Dubaniewicz-Wybieralska M, Skorek A, et al. Cerebellopontine angle tumours: Radiologic-pathologic correlation and diagnostic difficulties. Folia Neuropathol 2006;44:274-81. Beaman FD, Kransdorf MJ, Menke DM. Schwannoma: Radiologic-pathologic correlation. Radiographics 2004;24:1477-81. Kleijwegt MC, van der Mey AG, Wiggers-deBruine FT, Malessy MJ, van Osch MJ. Perfusion magnetic resonance imaging provides additional information as compared to anatomical imaging for decision-making in vestibular schwannoma. Eur J Radiol Open 2016;3:127-33. Weber AL. Magnetic resonance imaging and computed tomography of the internal auditory canal and cerebellopontine angle. Isr J Med Sci 1992;28:173-82. Hakuba A, Hashi K, Fujitani K, Ikuno H, Nakamura T, Inoue Y. Jugular foramen neurinomas. Surg Neurol 1979;11:83-94. Sigal R, d'Anthouard F, David P, Halimi P, Zerah M, Bely N, Doyon D, Hurth M. Cystic schwannoma mimicking a brainstem tumor: MR features. J Comput Assist Tomogr 1990;14:662-4. Sweasey TA, Edelstein SR, Hoff JT. Glossopharyngeal schwannoma: Review of five cases and the literature. Surg Neurol 1991;35:127-30. Caldemeyer KS, Mathews VP, Azzarelli B, Smith RR. The jugular foramen: A review of anatomy, masses, and imaging characteristics. Radiographics 1997;17:1123-39. Sanna M, Bacciu A, Falcioni M, Taibah A. Surgical management of jugular foramen schwannomas with hearing and facial nerve function preservation: A series of 23 cases and review of the literature. Laryngoscope 2006;116:2191-204. Sarma S, Sekhar LN, Schessel DA. Nonvestibular schwannomas of the brain: A 7-year experience. Neurosurgery 2002;50:437-48. Mc Cormick PC, Bella JA, Post KD Trigeminal Schwannoma. Surgical series of 14 cases with review of literature J Neurosurg 1988;69:850-60.